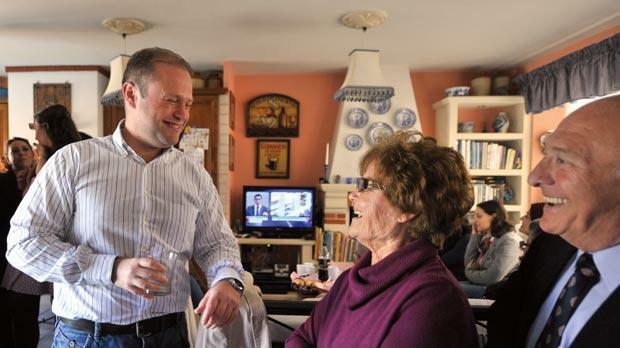 He secured the largest electoral victory in half a century but yesterday Joseph Muscat wrote history in more ways than one, becoming the youngest Prime Minister since Independence. Dr Muscat, 39, was elected Labour leader in June 2008, succeeding Alfred Sant after the party had suffered its third successive electoral defeat. He was sworn in as Opposition leader in October of the same year after Joseph Cuschieri gave up his seat in Parliament. Dr Muscat took the reins of a party fraught with internal strife and at its lowest ebb after the premature end of a Labour government in 1998. Over the past five years, Dr Muscat consolidated the party structures, bringing back Labour’s ‘lost sheep’ and reaching out to liberal voters. He built a broad coalition that also included exponents who once belonged to the Nationalist Party. It was this coalition that, in 2009, when still in its infancy, won the European Parliament elections with the same margin as in this general election. The die may have been cast then, with the Nationalists underestimating this young man who gave up his seat in the European Parliament to lead a bleeding party. Married to Michelle with twin daughters, Dr Muscat was born in January 1974 to a Burmarrad family. He is an only child. With his father a fireworks importer, Dr Muscat has constantly referred to his family roots when describing his aversion to bureaucracy that hinders business. Educated at St Aloysius College in the 1980s, he had experienced the closure of Church schools by the Labour government of the day, an experience that was reflected in the party’s 2013 manifesto with a pledge to continue financially supporting Church schools. Dr Muscat graduated in commerce and public policy from the University of Malta in 1996 going on to obtain a doctorate in management research in 2007. He worked as a journalist with the PL’s media arm and founded the party’s news portal maltastar.com. He was active in the party’s youth wing and, in 2003, after having campaigned against EU membership, was appointed to a working group with veterans George Vella and Evarist Bartolo to formulate the PL’s European policy. The working group was instrumental in changing the party’s anti-EU stand. Dr Muscat was the most successful Labour candidate in the EP elections of 2004 and, during his four-year stint in Brussels, was nominated vice-president of Parliament’s Economic and Monetary Affairs Committee. Today begins a new chapter for Dr Muscat – the most important and demanding of his political career so far.